Whew! That’s a lot of crap. If you click through to Flickr you can see all of the notes that describe my clean-up strategy. Wish me luck! 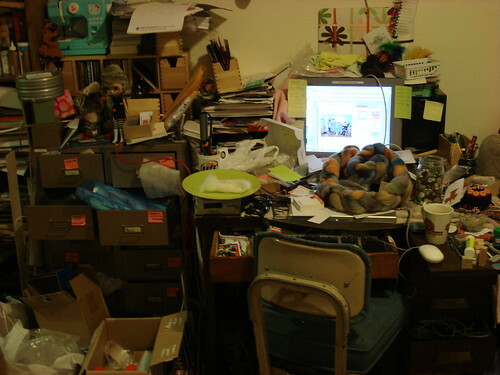 Is it bad that I’m reassured by seeing your chaotic area?! and i am really looking forward to seeing the AFTEr picture! that roving looks yummy too. :o) ek. p.s. is that a Hello Kitty sewing machine I spy in the corner? !